[fa icon="plus-square"] Can East 5 and East 6 co-exist? Yes, the GUI of East 5 is developed on MS Excel platform whereas East 6 is developed on Architect, an in-house platform developed by Cytel which is independent of any other external software. Thus, East 5 and East 6 can co-exist on the same machine. [fa icon="plus-square"] What is the simplest way to open my East® 5 workbook in East® 6? If you are trying to convert a workbook from East 5.4.2 then you can use the Convert Old Workbook utility which can be found under Cytel Architect → East 6.x folder (available under Start). This will allow you to convert your East® 5.4.2 workbook which you can then open in East® 6 by going to the Home tab and clicking on Open and Workbook. For converting workbooks created in older versions of East® 5, you will first have to open the workbook in East 5.4.2 (contact support@cytel.com to get this version), clone the last plan in the workbook and delete it in order to make East® 5 active. Then save the workbook in East® 5.4 using File and Save As. Once you have done this, follow the procedure described above for East® 5.4 workbook conversions. The Convert Old Workbook utility under Start→ Cytel Architect → East 6.4 supports all the older version files starting from East 5.0 to 5.4.2. So directly pass your East 5 workbook to this utility and get the converted workbook in East 6.4 format. [fa icon="plus-square"] Why do I occasionally get different results when my sample size calculation in East® 6 compared to East® 5? East® 6 by default computes an integer sample size whereas East® 5 computes a double sample size. This means that in order to match the results from East® 6 with East® 5, check the box “Do not round off sample size/events” available under Home → Options → Design → Defaults. [fa icon="plus-square"] Help! I am having trouble accessing the East® 6 user manual. The East® 6 User Manual and Tutorials can be accessed by clicking Home → Help → User Manual / Tutorial. This will open up the corresponding PDF in Adobe Reader. Note that you must have Adobe Reader installed on your machine in order to read the East® 6 manual electronically. We also provide a printed copy of the user manual on demand. Please contact support@cytel.com if you want one! [fa icon="plus-square"] Help! How to access East design level help? The design level help appears in the right hand side Help panel whenever the design is invoked. We can also see this Help panel from any other window by clicking the ? icon from the right hand top corner of the input window as shown below. This Help panel displays the control specific text as well. Just click on any input control and see the help panel updated with short description, acceptable range and input options. Read Cytel’s blog for interesting updates within Cytel and also in the clinical research industry. [fa icon="plus-square"] It seems like I cannot access some of the adaptive (or SSR) features in East® 6. What is the problem? East 6 is sold in a modular format, which means that the features to which you have access depends on your licensing. If you have license for BASE, SEQUENTIAL and ADAPT – You can use adaptive features for continuous and discrete endpoint tests. If you have BASE, SEQUENTIAL, SURVIVAL and SURVADAPT – You can use adaptive features for time-to-event or survival endpoint tests. 1-Sided Efficacy-Futility (H0 or H1 (B/NB) trials. Once you create a valid design, save the design row from the Output Preview area to Workbook (Library.) This can be done by clicking the icon. Now click S. The Include Options list on right hand top should have SSR. Contact support@cytel.com for any further queries OR sales@cytel.com to help you with your licensing. [fa icon="plus-square"] I am conducting a survival study. Do you have any advice on how to deal with non-proportional hazard rates? This is a perfect opportunity to use the Simulations feature in East® 6.3. In the East User Manual the chapter on ‘Superiority Trials with Variable Follow-up’ has a section on the ‘Simulating a Trial with Non-Proportional Hazards.’ This section demonstrates with helpful illustrations the implementation of non-proportional hazard rates through simulations. There is additional information on survival studies in the volume on ‘Time to Event Endpoints’ in the East User Manual. It covers different options available in East® for superiority and non-inferiority trials. [fa icon="plus-square"] I am having trouble entering accrual/dropout information for a Continuous or Discrete Endpoint Trial. What should I do? [fa icon="plus-square"] How do I enter dropout information in East® 6.3? Dropout in a survival study is a competing risk. You may specify dropout rate as a hazard rate or as a probability of a subject dropping out within a specific period after entering the study. People can estimate likely dropout rates in future studies based on dropout rates in previous studies. For example, a person's past experience may be that a specific percentage of subjects like 5% or 10% drop out of a study. Refer to the chapter “A Note on Specifying Dropout parameters in Survival Studies” under the volume on “Time to Event Endpoint” in the East® 6 User Manual. This note gives details on specifying dropout parameters for survival studies in East®. The chapter will use an example to explain how such estimates can be used in specifying input parameters for dropout rates in East®. 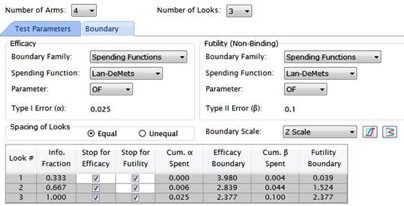 [fa icon="plus-square"] What is the approach to follow to carry out a sensitivity analysis in MAMS procedure? First a design for 4 arms and 3 looks with default parameter values was created. Next, the aim was to carry out simulations with different mean values for the three treatments keeping the SD values same as in the design. Three different values of mean for each treatment – Low (0.2), Target (0.4), and High (0.5) were considered. The possible number of combinations of these 3 values between 3 treatments would be 3x3x3=27. Since the 3 treatments have common mean values in the design, in the simulation, we can assume that the treatment codes are interchangeable. For example, the treatment combination of Low, Low, High values for treatment1, treatment2, and treatment3 is same as Low, High, Low combination. This way, the unique number of combinations of the three values reduce to 10 from 27. Basically, the interest is in comparing the effect of the two futility options on power and average sample size. From the results we can see that under Alternative 2, which follows ‘drop the loser’ rule, the power reduces slightly compared to Alternative 1. But the effect on the average sample size can be worth noting as it is considerably less under Alternative 2 compared to Alternative 1. [fa icon="plus-square"] How should we cite East software in our documentation? “East 6 (2016). Statistical software for the design, simulation and monitoring clinical trials. [fa icon="plus-square"] Do I need administrative privileges to install East® 6? Yes, you need administrative privileges to install and update East 6 using your Update License Utility. [fa icon="plus-square"] What are the Minimum System Requirements of East 6? [fa icon="plus-square"] Does East 6 work on virtual machines? By default, the standalone version of East 6 doesn’t work on virtual machines (VM) as the license is without VM support. However, we can create VM supported licenses on need basis. The network version (East 6 clients) should work on virtual machines. [fa icon="plus-square"] Is East 6 supported on Apple machines? East 6 is not natively supported on Apple machines without buying a virtualization product like Parallels. Please see above for information on running East in a virtual environment. [fa icon="plus-square"] Does the East Network licensing have any logging capabilities? [fa icon="plus-square"] Can you run East 6.4 and earlier versions of East 6 side by side? As of now, any version of East 6 cannot run side by side with any earlier version of East 6. One has to uninstall the existing version of East 6 completely, remove all the residual files/folders and then install the latest version. [fa icon="plus-square"] How to apply the license or update it using the utility? You will receive the East 6 license in a file named ‘lservrc’ from Cytel. Save this file on your local directory. Go to Start → All Programs menu of the computer. Right click on the Update License utility under Cytel Architect → East 6.x and Run it as Administrator. Select the license file using Browse button and click Install. The installed modules can be seen in the lower window of Upgrade Log. You can now restart East 6 for the new license to take effect. [fa icon="plus-square"] I am receiving a “Requested License Not Available” notice when I try to access certain features. What does this mean? East® 6 is sold in a modular format. This means that to access features in a certain module, you must have other required modules as well. For example, to access features in East® ADAPT, you will also need licenses for East® SEQUENTIAL and East® BASE. Contact support@cytel.com for any questions on licensing. [fa icon="plus-square"] Can you provide us the information on installation and operational validation of East software? Please note that before we release the software to clients, our QA team carries out extensive manual as well as automated testing. To ensure the consistency of results from old and new versions, and that regression testing on all the features of the software is done as well. But the test cases used here are for internal use only. Running these programs create log files. Note that these programs are widely used by our other clients and generally do adequate testing before actual deployment of the software. This script verifies whether the software is completely and correctly installed on the system or not. It does this by checking whether all the software components, XML and DLL files are in place. This script runs some representative test cases covering all the major modules/features of East and compares the runtime results to the benchmarks (benchmarks are validated results stored internally in the OQ program). This ensures the quality and consistency of the results in the new version. In addition to IQ/OQ, if you want to do more testing, please feel free to refer to the user manual and reproduce the results for some representative examples/modules. You may want to find out from your statisticians about their favorite features/modules and run those examples first. The flow of examples is very easy to follow. Some examples in the manual require additional files (datasets) which are available to you in the Samples folder. We do have a dedicated chapter to describe how every single feature was validated. Please refer to the appendix chapter V on “Validating East Software”. This covers validation strategies for all the features available in East 6.4. [fa icon="plus-square"] How do I integrate R with East®? The feature of R integration in East® 6 can be used to run simulations by writing your own R functions. Refer to Appendix on “R Functions” of the East® 6 User Manual for more details on syntax and to “Tutorial: Survival Endpoint” for a worked out example. Please note that the R software is not a part of East 6. You need to install it separately. Once R is installed on the machine, connect it to the East® 6 system by providing the path of the R installation directory. In order to do so, go to Home → Options → Global Settings → General. Once this is done, please verify the log window where you will find the R version connected to East6. [fa icon="plus-square"] What versions of R are compatible with East 6? East 6.3.1 is compatible with R versions between 2.9.0 to 2.15 whereas the latest release, v.6.4 is supported up to R 3.2.3. East may or may not work well with later versions of R.
[fa icon="plus-square"] Is R a mandatory requirement to run East 6? Absolutely not! Note that if R is not installed, the ability to include custom R functions to modify specific simulation steps will not be available. R integration feature is an Add-on to East and is completely optional. It is required only to integrate custom R functions with East. But note that this feature doesn’t affect any of the core functionalities of East. [fa icon="plus-square"] I have a problem opening East 6. I get the dialog box with the error below. I recently updated R version on my machine. This problem is usually due to a newly installed version of R, which has changed the path, but the path wasn’t updated for East. Please run the file RSetReg.exe in your R “bin” file for the version of R which you want to use for East (eg. C:\Program Files\R\R-3.2.2\bin\x64.RSetReg.exe). This *should* clear up your problem. If it does not, you could try renaming the “ArchitectSettings.mdb” file in your appdata folder location (eg. “C:\Users\Brent\AppData\Roaming\Cytel\East 6\6.4”) to “ArchitectSettings.mdb.old” and reopening East. Either of these two fixes should clear up your issues. Please let us know at support@cytel.com if you still have problems.